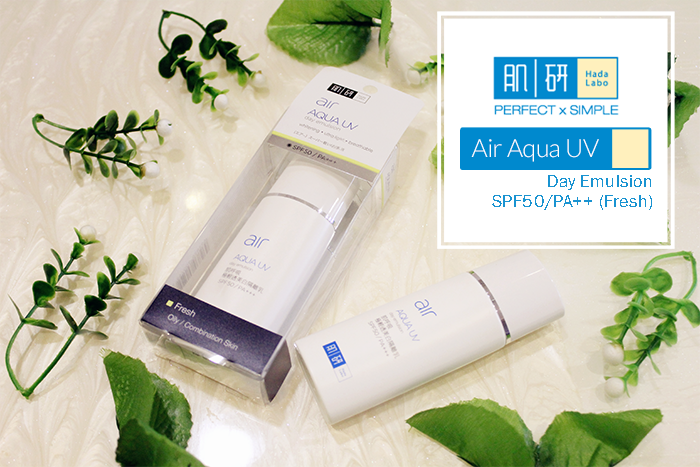 The Air Aqua UV Fresh/Oil contains Sebonormine that helps to control sebum secretion and minimizes the apperance of large pores. Skin will becomes less shiny, matte and fresh upon application. 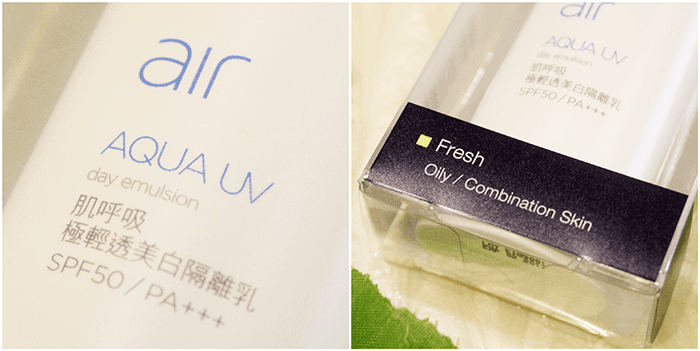 For your information, Hada Labo Air Aqua UV SPF50/PA+++ is a new sunscreen innovation that offers advanced 5 UV Defense System againts UVA and UVB with a smooth feather light texture. Contains superiors photostable ingredients that do not break down easily under the sun to provide long-lasting protection against UVA and UVB. Agetect, a key ingredient contain in this product helps to minimize the appearance of fine lines, wrinkles and maintains skin elasticity. Contains Resveratol and Vitamin C to help brighten and even out skintone. Resveratol is a powerful oxidant with an brightening function. It is naturally found in red wine. 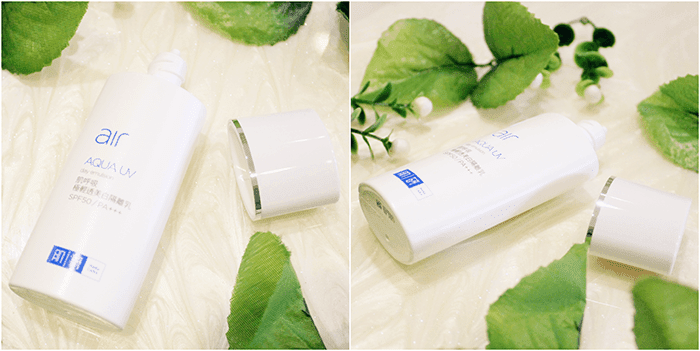 It deeply hydrates wit Super Hyaluronic Acid and soothes dry skin caused by sun exposure. White bottle of packaging with simple fonts and logo creates a simple and nice design. Nothing special with the appearance that makes me feeling wow pow. It's also kinda reminds of old sunscreen too. Slim and sleek design with simple tip nozzle. However, this kind of design is the easiest to control the quantity while also travel friendly too. At least, it won't split out under pressure in the luggage. The texture is in white color and so liquidy. It's probably split out whenever I open the lid. Then, I squeezed out too much on my first try. It's really give a feeling of milky greasy type of texture feeling but in real, it's doesn't. It is definitely not like what I actually expect from old kind of suncreen. I felt milky but fresh and light when applying. This sunscreen is easy to blend and does not gives me a greasy feeling during application. However, what I found was it creates an unnatural slight white cast on face which I do not like in general but luckily this suncreen will oxidize and blends into out skin quite naturally after awhile upon application. I wore only this sunscreen a day to try it out how's good was this sunscreen can goes. It's give me shine-free finish but not matte-finish. My face does not feels heavy after application. For oil-control part.... neh.... nothing much expect with this sunscreen at all (although most of sunscreen never with oil-control function inside but still expecting...) My face becomes oily like normal after several hours under sunshine. This sunscreen gives me a fresh feeling (not completely bare feeling but almost there) but right then after several hours, I feel kinda uncomfortable with my face anymore. So in conclusion, this suncreen does not gives lasting in shine-free and it's not matte-finish. 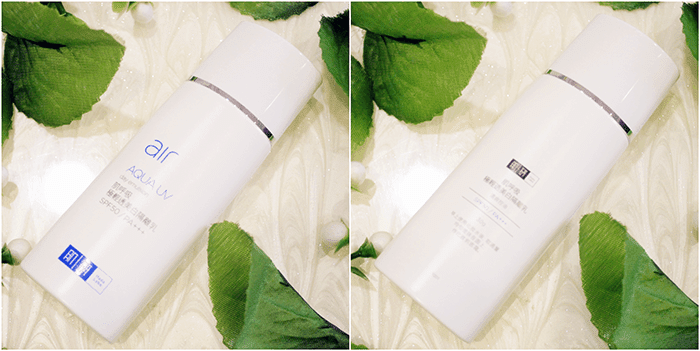 Hada Labo Air Aqua UV Day Emulsion SPF50/PA++ in Fresh is a worth buy product. It's looks like a old kind of sunscreen in many ways but still good enough as a daily sunscreen because contains high SPF level with double PA label. Although the texture looks milky but it is light and fresh yet easy to blend upon application. However, for those who hate the 'sunscreen' smell, it might not under your choice-list. 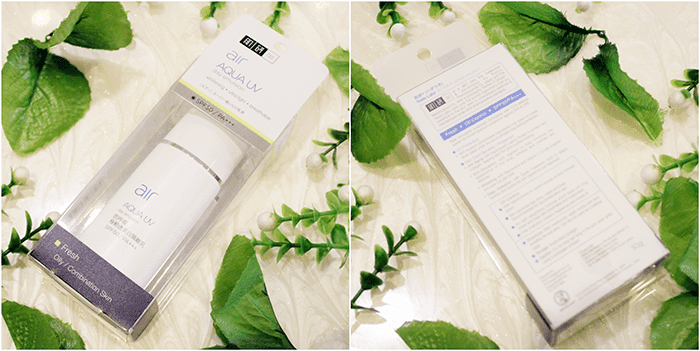 Overall, this sunscreen is suitable for those who prefer light and fresh kind of texture no matter in what skin types you are except for sensitive skin (better check it out how sensitive level you have). I finally get to read the Fresh version! I got the Moist version.